Southern magnolias, Magnolia grandiflora, are widely considered to be one of the most beautiful and sought after tree species in the Southern and even Western United States. Not only are they often extremely large at maturity, but they live for upwards of 100 years under the right conditions, and explode all summer long with the most amazingly large and striking white flowers throughout the entire canopy. I began my care of magnolias in the Bay area of Northen California about 18 years ago. Pruning and general fertilization to these amazing trees in the deeper soils of Northern California was generally only preventive care, storm damage repair and general maintenance, as most were vigorous and healthy and not many challenges arose. Here in Central Texas, caring for magnolias is a different issue entirely. Although the species will grow here, even in rocky soils, their needs really need to be assessed based on the site. Our soils vary widely. Some soils such as those of South and North Austin, Round Rock and Cedar Park are very rocky and riddled with shallow limestone and very little good soil. The rocky soils are very high pH (alkaline) soils. Other areas such as downtown and East Austin, and Northwest Hills have much deeper soils. Areas by Lake Austin have flat alluvial and extremely fertile soils from years of silting and produce magnificent specimens. Having cared for them in all these areas, I must note that most of the problems magnolias have here are soil related. Additionally, compaction and lack of mulch often exacerbate already poor general soil conditions. Lack of water, in addition to one or more of these factors, is also a limiting factor in the summer months especially. Soil amendment to add topsoil and lower pH, mulching to 3 inches (max) and watering during the hot summer months are a great things to start doing if your magnolia is thinning and stunted. Magnolias are one of those species that, in addition to their macro-nutrient requirements (N,P,K,S,Ca,Mg), they also require certain micro-nutrients in larger amounts than other species. Iron and Zinc are two of the most widely lacking micro-nutrients for magnolias in this area. Zinc, for example, is needed for the blooms. Iron is needed to prevent interveinal chlorosis (yellowing between the leaf veins). Additionally, magnolias thrive in low pH, acidic soils. Although they will grow in alkaline rocky calcareous soils, they do not get large and grow very slowly, and are of course more prone to nutrient deficiencies. In addition to general soil amendment and mulching, yearly fertilization is also recommended. When we apply the general slow-release, granular fertilizers we use, we also add a magnolia ‘micro’ mix to add missing micro-nutrients. 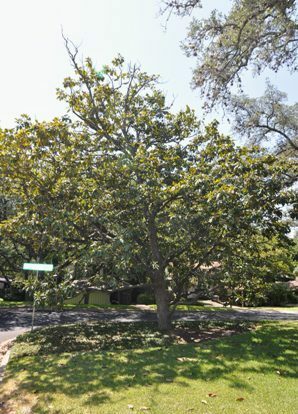 I have brought many magnolias back in the Central Texas area over several years, and find that they will thrive if given the right minerals, mulch, water and soil conditions, including lowering the Ph. If you have a stressed or stunted magnolia, Call us and I can prescribe a recovery plan over several years that will significantly increase the trees vitality and overall health. Is your red oak turning yellow? Should I plant a bald cypress in Central Texas?